Potthast, the son of working class parents, was born in Cincinnati, Ohio, 10 June 1857. His father was a chair and cabinet maker, while his mother was a clerk and milliner. By 1870, at the age of thirteen, he participated in the second annual exhibition of the McMicken School of Design. He is listed as a student of Thomas S. Noble by 1874, while apprenticed to the Ehrgott Krebs Co., Lithographers. In 1879 he found employment with the Strowbridge Lithographing Co. Probably in the fall of 1882, he accompanied his friends, Joseph Henry Sharp and Charles Haider, to Antwerp, where they studied with Charles Veriat. Potthast then journeyed to Munich where he studied with Nicolas Gysis, Ludwig von Loefftz, and possibly with Carl Marr. By 1885 he had returned to Cincinnati and was again employed by Strowbridge. In the evenings he studied at the Art Academy of Cincinnati where he was again a student of Thomas S. Noble. A few years later he returned to Europe, where he was attracted to the Forest of Fontainebleau, Barbizon, and Grez in France. Under the influence of Robert W. Vonnoh, he discovered the work of the French Impressionists. From 1889 to 1891 he exhibited paintings at the Paris Salon where he was listed as a pupil of Fernand Cormon, who was known for his canvases of prehistoric themes. On his return to Cincinnati Potthast resumed his employment in lithography, while exhibiting at the Cincinnati Art Museum. In 1896 he moved to New York City, working as an illustrator for Harper's, Scribner's, and Century magazines. He was elected an Associate of the National Academy in 1899, a full Academician in 1906. An inscribed photograph indicates that in 1905 he probably again travelled to Europe. Around 1908 he had turned his full attention to painting, moving into the Gainsborough Building at 222 West 59th Street. A number of his paintings show views from his studio which looked down upon Central Park. He participated in an excursion to the Grand Canyon sponsored in 1910 by the Atchison, Topeka and Santa Fe Railroad with Thomas Moran, Elliot Daingerfield, Frederick Ballard Williams and De Witt Parshall. He also travelled to the Canadian Rockies. During the First World War he was engaged in painting large floating targets for naval practice. 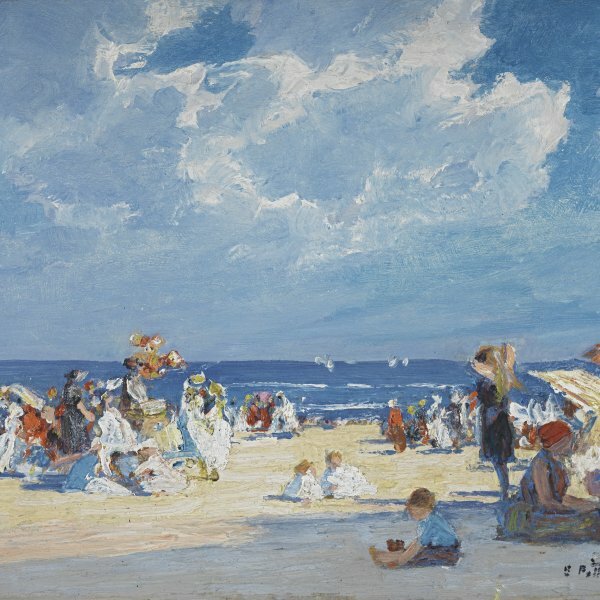 Potthast was a member of the Society of American Artists, The National Arts Club, the Lotus Club, the Salmagundi Club, and the American Water Color Society, as well as a number of other organisations, and was a recipient of a numerous awards and medals. Potthast died suddenly of a heart attack in his New York City studio on 9 March 1927. In November a memorial exhibition of the artist's work was held at the Traxel Galleries in Cincinnati. The heirs of the artist by this time had destroyed all sketches, unfinished, and unsigned works which were not considered to be up to the standard of his late work, so that "no inferior work would be placed on public sale."